Currently Reading: A Conversation with Ian Bremmer, President of Eurasia Group. A Conversation with Ian Bremmer, President of Eurasia Group. The philosophical ideas of reductionism have driven a huge amount of our world-view. Whether it’s ontological, methodological or theory-based we try to explain our world by reducing it down to the smallest possible systems and components such that we are not humans, but an interaction of cells. The challenge however, is that in reality we are in a complex world- made difficult to model because of the nonlinear, emergent, spontaneous and adaptive interactions of trillions of elements. Whilst our biological and environmental complexity has had millions of years to evolve into a form of stable-chaos, our cultural, economic and political complexities are growing in scale and momentum meaning that for many of us- this world feels riskier than ever before. 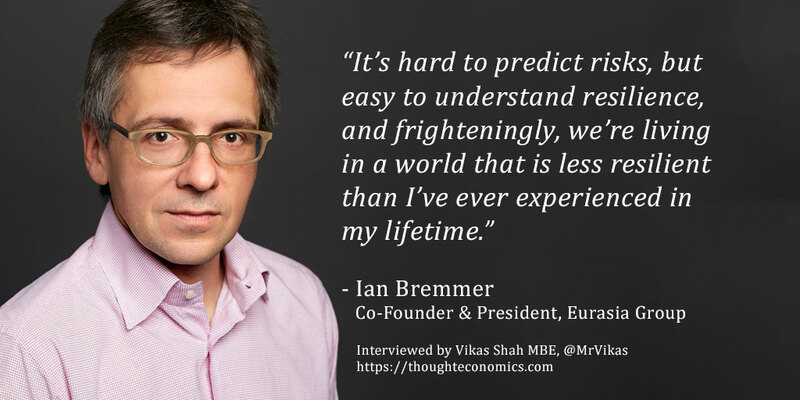 To learn more about the risks facing our world, I spoke to Ian Bremmer, President and Co-Founder of Eurasia Group (one of the world’s leading political risk research and consulting firms). Ian is also Global Research Professor at NYU, and Co-Founder of GZero Media. Q: How risky is our world? [Ian Bremmer]: We are at an interesting time for our world. Globally, the economy is doing well; certainly, better than any point since 2007, and in the United States perhaps better than any point since the 1990s. When the economy is doing well, it papers over a lot of problems and gives governments the flexibility to make mistakes. Despite this economic progress, the countries of the West feel incredibly divided- which implies that when economies start to slow down or turn, things will get a lot worse. We’ve entered a geopolitical recession, where the old US led world-order is unwinding. This isn’t just a Trump issue- it’s about Europe, BREXIT, about Russia undermining the US and the West, the rise of China and its alternative political and economic models. Even if Trump were gone tomorrow and you had a president who was committed to all of the allies, you wouldn’t build a Pax Americana. The geopolitical recession is exacerbated by the lack of anyone being willing or able to take (or replace) the American role- thus, we are left with an enormous amount of instability, and little resilience. Our world today is less able to respond to shocks. I’ll give you one example. After the 9/11 attacks, the United States was incredibly united in response- and every global ally joined the United States on that mission, called Operation Enduring Freedom. Imagine we had an attack today- whether physical or cyber- the idea that Trump would have 92% approval ratings to take decisive action is inconceivable, it just wouldn’t happen. He has incredible support from less than half the country, and everyone else are considered enemies of the people. It’s hard to predict risks, but easy to understand resilience, and frighteningly, we’re living in a world that is less resilient than I’ve ever experienced in my lifetime. I refer to a world with a leadership vacuum as being G-ZERO; and you see this not just at political summits, but through the actions of China with projects such as One Belt, One Road where they’re not trying to be the best America, but rather that they’re trying to create their own institutions, their own position as a global superpower in AI….. this is a direct threat to the US-led global order. Q: What are the implications of the reduced openness of nations? [Ian Bremmer]: Trump recently came to the UK and spoke openly about his views on how immigration is a danger to the continent; that’s not what Europe was based on. Europe was based on an openness and transparency- and on free-movement. Europe was based on bringing people in- and giving them the opportunity to flourish- taking the best of all cultures and views. The United States certainly benefited from being a melting-pot, and we’re now seeing a lot of people who don’t feel that way anymore. Today’s political momentum is toward homogeneity, keeping people out. When Trump talks about ‘my people’ he’s not talking about the American people, he’s talking only about those who voted for him. The same is true for all of the populist leaders we’re seeing across the world, who are gaining increasing support. Populism and this inward focus also brings economic protectionism and demands for policies that support local workers at all costs. The fact is that open borders and open trade are the best ways to ensure economic growth- that has been true in the past, and is true now. Governments need to not look away from globalisation, but to make sure it works for everyone- to take care of those who lose out, and to make sure that the wealth is more evenly spread. In the past 40-50 years, we’ve seen middle class and working-class incomes remain (at best) flat, whilst the top 10% have been doing extraordinarily well, and it’s perfectly understandable therefore why people no longer support the policies that got us here. Q: How is our financial system being weaponised? [Ian Bremmer]: Around the world, governments are taking economic influence as a way to pursue shorter term and narrower national interests – which undermines the global free market. The rise of populism, backlash against globalisation, and movement against open borders means that populations support the weaponisation of economies even though it doesn’t work to their own advantage. China will soon be the world’s largest economy and is a state-capitalist nation meaning that the government controls the largest part of the economy. Unlike free markets, that means that finance is necessarily a critical tool of government. Compare this to the United States- just because the government doesn’t like a specific country, that doesn’t mean that Coca Cola won’t invest there- business decisions are not measured on the basis of being patriotic or unpatriotic. In China though, major corporations are a tool of government and so if we’re moving to a world where China is going to be the dominant economy, by definition finance will be their weapon. Q: What are the key skills organisations need to survive in a risky world? [Ian Bremmer]: Businesses have to think strategically, not just respond to quarterly earnings reports. It’s much harder to behave in a way that supports long-term trust if you only respond to earnings reports and that’s why so much corporate trust has eroded. We need boards that are stronger, and able to resist the temptation and pressure to maximise short-term profitability at a cost to stakeholders such as customers, workers and the community. Many of today’s technology businesses grow so fast that they’re simply unable to have the leadership and cultures in-place to consider the long-term implications of their business-model for a broader set of constituents than just themselves. Businesses that have decades of experience working globally across cultures and different market are much more sensitive to political and cultural differences between markets, but tech companies that move from zero-hero in a few years, and operate primarily in a single large market such as the United States run the risk of viewing all customers as largely undifferentiated- which gets them into trouble…. Take Uber for example. When you’re not in a geopolitical recession, political risk still matters, but it matters largely at a country level and primarily in emerging markets. But in a geopolitical recession, suddenly the biggest macro risks are by their nature political. And you focus less on growth and more on stability and resilience, and that’s a problem because the free market model tells you ‘don’t focus on resilience and stability, focus first and foremost on growth and everything else will take care of itself’. Q: Are you hopeful for the future? [Ian Bremmer]: For those in the United States and Europe who feel a sense of hopelessness- it’s important to remember that you’re incredibly fortunate to be born in parts of the world where you have every opportunity to progress, get an education, and have healthcare and more. It’s almost an abomination for someone with the kind of wealth that we have as a community to not have hope. Life is such a gift, and the good fortune we’ve had to be here is extraordinary. Ultimately… the only thing we have any responsibility for is our own actions, and we need to own that and be purposeful. There is a less existential way of looking at hope too. On one hand, we’re living in an environment where we’ve actually- in the last 20 years- reduced extreme poverty by half. We’ve never lived in a world where relatively so little of humanity is suffering, and that is objectively an extraordinary thing. The vast majority of the world’s population is literate, getting immunised, and having a chance to flourish, and those trends are continuing. For the last 50, 100 even 200 years, almost all of the world’s problems have been solved by a relatively small group of white men- and now we’re bringing diversity to the challenge; we’re opening out the future of our world to several billion people not just a few hundred million, and with that level of entrepreneurial thinking capacity I would see our civilisation growing exponentially, and that gives me hope. The thing that I’m less hopeful about is the fact that if the world is turning away from being governed by the wealthy and by high-income countries, and instead the world is going to be governed by China and other median income countries (where the majority of the world’s wealth increasingly will reside), that will mean a lower quality of governance. Human rights will not matter as much, the world will be more polarised, it will be more brittle, it will be less resilient and the political institutions won’t work as well, and that’s a serious problem but not one that we can’t solve. Ian Bremmer is the president and founder of Eurasia Group, the leading global political risk research and consulting firm. He is a prolific thought leader and author, regularly expressing his views on political issues in public speeches, television appearances, and top publications, including Time magazine, where he is the foreign affairs columnist and editor-at-large. Once dubbed the “rising guru” in the field of political risk by The Economist, he teaches classes on the discipline as a professor at New York University. His latest book “Us vs. Them: The Failure of Globalism” is a New York Times bestseller. In 1998, Ian established Eurasia Group with just $25,000. Today, the company has offices in New York, Washington, San Francisco, London, Sao Paulo, Singapore, and Tokyo, as well as a network of experts and resources in 90 countries. As the firm’s president and most active public voice, Ian advises leading executives, money managers, diplomats, and heads of state. Ian earned a master’s degree and a doctorate in political science from Stanford University, where he went on to become the youngest-ever national fellow at the Hoover Institution. He received his bachelor’s degree in international relations from Tulane University.